I'm not trying to rub it in, I'm just saying ... why can't we have a little vision when we're building new facilities, such as Red Hook's Brooklyn Cruise Terminal? "the piers should be used efficiently and in a way that has as little negative impact on their surrounding populations as possible. And, hey, some positive impact would be nice as well." 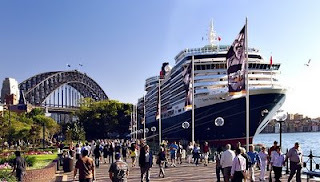 Cruise terminals all over the world are open and accessible to the public, even when the ships are in port, and are often a destination in themselves. 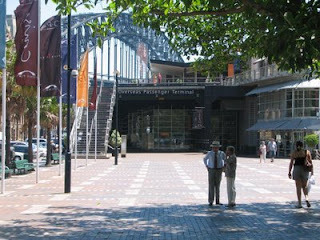 In my old home town of Sydney, the Overseas Passenger Terminal, as it is called (more pics here), is integrated into its surrounding historic residential and commercial neighborhood. Within the terminal are restaurants, cafes and spaces for private events, and outside is a sea level promenade you can walk along when the ships aren't in port. Even when the ships are in, you can get pretty close to them - something I was even able to do with container ships when I was visiting the port town of Fredrikshavn, Denmark recently. In both Sydney and in Denmark, security was present, but not so suffocating as to keep onlookers from enjoying the port-side experience. 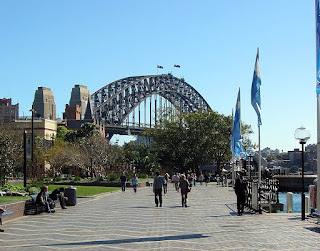 Getting back to Sydney's terminal (as I have done a number of times in the last 10 years), it is also surrounded by parks, and benches with shady trees inviting people to pause, sit and take in the sights. 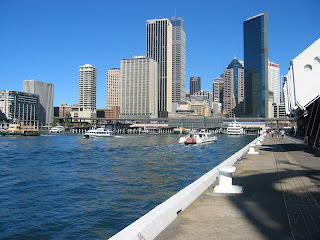 Ferries motor by on their way into Circular Quay, surrounded by commercial and residential populations. 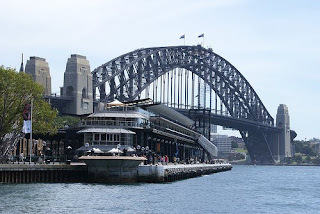 As well as being the location of the Cruise Ship Terminal, Circular Quay is the main ferry terminal in the Sydney CBD, having something like 5 or 6 wharves there, right next to a main train and bus terminal. Sydney, like New York, is a harbor city, but unlike New York, the harbor is used efficiently to transport its commuters and sightseers - the ferry system is part of the public transport network and is subsidized accordingly (as the MTA and roadways are in New York), providing another great, relaxing alternative to driving to work or otherwise getting around. When the NYC Economic Development Corporation came to our neighborhood late last year to press the contentious case for Phoenix Beverages' accommodation at Pier 11, right next to the Cruise Terminal and adjacent Atlantic Basin, their representatives seemed quite cognizant of the fact that they had not delivered on the promises of their previous big project - the Cruise Terminal itself. 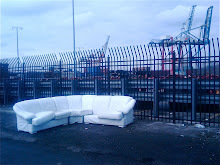 Not only had they neglected to install the carcinogenic-pollution alleviating "Cold Ironing" infrastructure for the ships, but they'd also not made any attempt to integrate the Cruise Terminal into the neighborhood. Onlookers were barred behind razor wire fences, and the Terminal itself was a no-go zone for non-travelers, surrounded by acres of underused parking, essentially being (for most of the year) a barren, asphalt wasteland. Where had the landscaping gone - the type seen in the initial renderings when the terminal was first proposed at pier 7? (Here's a low resolution version - anyone have any better ones?) Where were the trees, the benches, the outdoor space and public access? Weren't there some cafes or the like in those initial renderings? Why had the EDC allowed this terminal to be built in such an un-people friendly way? Now that the EDC has allocated almost all of the remaining piers for the use of American Stevedoring (either by proxy, via Phoenix Beverages with their 20-year lease, or otherwise), it seems only right that they revisit the Cruise Terminal and attempt to right the wrongs thrust upon our neighborhood by its poor planning. With the EDC's seemingly inevitable plans for the Atlantic Basin being secured with Phoenix Beverages (apparently) having recently signed a lease, many people-friendly options have been shut out for the foreseeable future. A few have survived, such as the inclusion of the operations of PortSide New York, and the accommodation of the Brooklyn Greenway. However, there will be not as much public access, nor open space as many of us had hoped for, and the inclusion at the Atlantic Basin of New York Water Taxi's visionary plan for a "green marina", public access, open space, boat repair, hundreds of additional new jobs and expansion of their fleet seems all but, excuse the expression, dead in the water. Hopefully, Red Hook's long-term friend and good neighbor, Tom Fox from New York Water Taxi, will have some presence at the Atlantic Basin, and we won't lose his entire operation to New Jersey, but that remains to be seen. So - and I'm trying to make lemonade out of lemons here - how about some improvement and positive impact regarding what we have left to work with, i.e. the cruise terminal? I'll leave you with a few more snaps to ponder ... and to perhaps inspire some ideas for what might be possible on our waterfront ... with a little vision. Click on this one for a panorama. 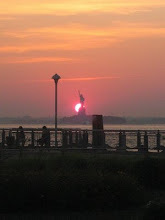 Makes you wonder what they were thinking leaving everything a sh!thole surrounding the Brooklyn port. Not cool at all. Amazing. I was in Bermuda a few years ago and the same is true. The cruise ship terminal is part of a historic pier with all kinds of shops and restaurants. A destination year-round. But, then San Juan, a different story. Asphalt wasteland. You'd think it was common sense. Hopefully they will still keep public access with boat repair shop(s)near. Can not imagine this place without public access.